In January 2017, the pitch at KGV passed into the hands of Kinross Astro, a new charity (Reg No SC046225) set up to run the facility for the benefit of the community and to promote hockey in the Kinrossshire area. The pitch was relaid with a TigerTurf EvoPro sand-dressed hockey surface in 2017. 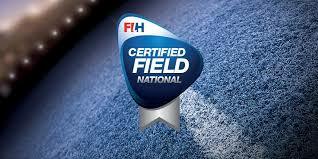 It is certified for National level games by the FIH. The pitch is available for hire from Kinross Astro. Changing rooms and toilets will be made available with all hires. The bar (which may also be suitable as a classroom) may also be available by separate negotiation with Kinross Rugby Club. The basic prices for the full pitch are £60/hr (£70/hr with floodlights). Reductions on this rate are available for block bookings and for half pitch bookings. Please complete the form below, letting us know the details of when you'd like the pitch.